Well, as some of you know, I am in the middle of a job search. I never thought I would be struggling right now, but it turns out that a) the economy still stinks b) the Triangle is a competitive region & c) no-one wants to pay someone who is overqualified right now. So, if you know of a job opening please pass it along! Anyway, this ordeal has made me think a lot about what I love to do in life and what motivates me. I knew for some time that a good friend of mine, Gary Ribet, has been kicking around the idea of starting a guide service. And with a little nudge from myself and Wendy Tonker, we officially launched it. Now things are still a long way from complete, but we are both official NC kayak fishing guides and are open for trips any day of the week. The website has been re-done (and may get re-vamped again), the insurance is in place, and we are ready to start our marketing campaign. Best of all, we offer a no fish, no fee guarantee! 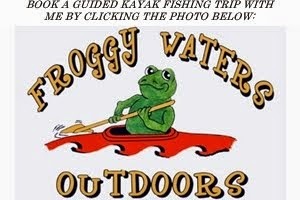 We are offering guided yak fishing trips, wade trips, fly fishing lessons, and just relaxing float trips. We are based out of north Durham, but have access to a ton of private water and will travel to put you on fish. Gary has a vast knowledge of waters all over the state - from the mountains to the coast, so pleaes shoot us an email if you are interested. We are working on setting up a number of sponsors and will be carrying some great products. 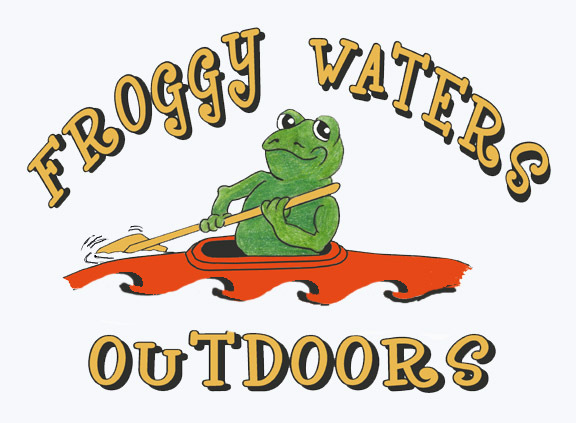 We are also planning on holding a Froggy Waters Outdoors tournament this October. The format is going to be different than most - much for fun, relaxed, and family oriented. Proceeds will go to the "Take a Kid Fishing" Organization. Check back soon for full details! It is going to have a bunch of cool sponsors and prizes! So, if you or someone you know want to take one of our Jackson Coosa Elite, Native Ultimate, or other kayaks for a spin, just email me or leave a comment here. Check out our site for full details - Froggy Waters Outdoors! Is this your new business? congrats! I would get rid of the no fish, no fee rule. Most people that hire you are doing it for your knowledge, they understand bad days. They want to learn. Anything. Good luck with this Drew. Sounds cool. Congrats & Good Luck on the new venture.. I can sympathize with you on the job market. I have been working an Accounting/Finance job since I graduated with my Management/HR degree 2 years ago. But I'm actually headed back to get a Master's in something unrelated to business. haha.. Hopefully I don't over qualify myself to much. Thanks guys - I appreciate the comments, feedback, and advice! It is proving to be a ton of work and effort, but is starting to pay off for sure. Plus, I have two great leads on jobs....things are looking up!